The Blue Dress is a jewelry business that was built around the philosophy that what you wear makes you feel better. Jennifer of The Blue Dress creates each of her jewelry pieces with her philosophy in mind, hoping that the wearer will feel more beautiful more confident and more prepared to face the world. The Blue Dress features beautiful jewelry in sterling silver and gemstones. Jennifer has begun working in polymer clay and has included it in her unique silver designs. My favorites in her etsy store are her Wild Vines and fern designs in sterling silver although I have to admit that the rebellious attitude of her "I don't do....." pendants makes me smile. Jennifer sells her lovely jewelry on etsy where she is a member of the Starving Artists Street Team. She also writes a blog about her adventures in jewelry design. Read the story of Jennifer's Inspiration in her etsy profile. 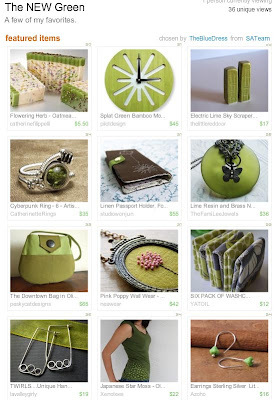 The Blue Dress was kind enough to feature Bonnie's Lime Green Resin and Brass Necklace in the recent etsy treasury The New Green. Thank you Jennifer for you inclusion in this lovely collection of items.